A week or so ago I asked the readers of my blog to “nominate” a person that they thought would appreciate a pie. My friend Gary wrote to me and suggested that I make a pie for his friend Roberta. This is what he said about her, “She is a woman who will do anything to help others and I have experienced her kindness and “givingness” in so many ways.” With an intro like that it was certain that Roberta was going to get a pie. When I wrote back to Gary, I asked for more information – Would Roberta prefer a sweet pie or a savory one? If savory, could it include meat (sausage, bacon, etc)? And since I always wonder how someone I don’t know might react to my bringing them a pie I asked Gary if he wanted to call ahead to introduce me. As you might have guessed, I needn’t have worried. Today I called Roberta and explained my “pie project” and told her that Gary had suggested her name as a pie recipient. 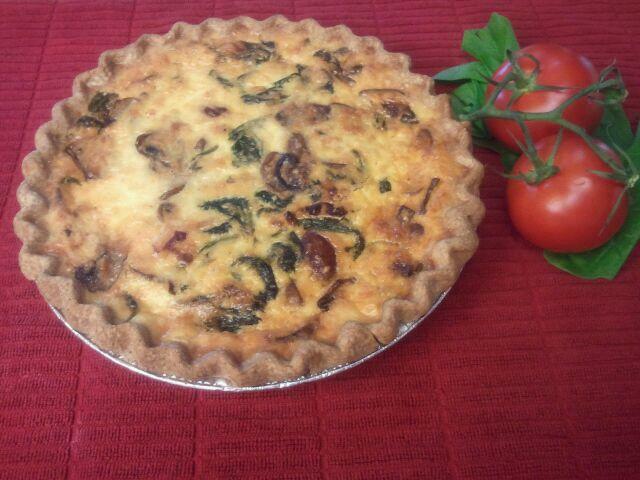 When I said that I had made her a Spinach, Mushroom and Sun-dried Tomato Quiche she seemed delighted. She told me, “You don’t know how perfect this is” and then explained why my quiche was exactly what she needed today. While I don’t understand how this confluence occurs, I am honored to be involved. As I was saying goodbye to Roberta, she told me that she planned to share her quiche with several friends and that I could not imagine how many people would be touched by this one pie. In a way she is right… and that is part of the beauty of this endeavor.